The main one being weight gain around the abdomen having a waist circumference of more than 40 inches in men and about 35 inches in women. HDL cholesterol of 40 mg/dl or lower in men and 50 mg/dl or lower in women. Serum triglycerides which are the main ingredient in animal fat and vegetable oils and are the most common form of fat that we digest in the body. They should not be over 150 mg/dl. Remember that metabolic syndrome is not a disease in itself, it is a group of these risk factors. If you suffer from metabolic syndrome then you are at an increased risk of developing type 2 diabetes and cardiovascular disease. Now the connection it has with gout is that high levels of uric acid in the blood has been found to be a key factor in causing metabolic syndrome. 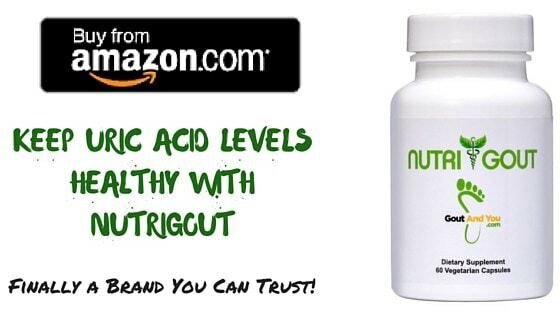 High uric acid levels basically disrupts normal metabolism. Now there are many studies that confirm that gout is part of the metabolic syndrome and surprise, surprise; the findings from different studies all confirm that the prevalence of metabolic syndrome is pretty high in gout sufferers. It is pretty high as well with those who suffer from rheumatoid arthritis. But what these researchers are finding is that sugar/fructose plays a big role in metabolic syndrome just as it does in gout. Let’s examine the link. In a popular H.K Choi study that I have cited in previous posts, states that soft drinks or any fructose consumption raises the risk of gout. Did you know that fructose is the only carbohydrate known to increase uric acid levels? So higher uric acid levels coming from fructose consumption can lead to gout and metabolic syndrome. Double whammy right? Adopting a low sugar/fructose diet is important for gout sufferers and those that also suffer from metabolic syndrome. I always advocated that you should not consume more than 25 grams of sugar a day. If you are disease free then you can consume up to 50 grams a day but since we suffer from gout and are more sensitive to fructose keep a limit of 25 grams daily please. You don’t want to risk developing other diseases on top of gout. You can avoid metabolic syndrome rather easily. Eat properly and exercise. There is a study that those that live a sedentary life are at the highest risk of developing metabolic syndrome but then again, if you don’t move much you at an increased risk to develop everything else too! So get off the couch turn off the TV or Xbox and move your body. That’s it for today folks! I came across this while researching for my 13yr old with autism, have thought for a long time his outbursts were pain and arthritic in nature. Laughed at by doctors of course but a couple of days on uridine (breaks down uric acid) and he is smiling all the time (first time in many years). I am waiting on the capsule form to come – when you smell this stuff you will realise why. Unfortunately I am afflicted with gout. I say I found out by accident because when the flare up stopped I thought it was due to me eating all the right things at the same time, I was out of my RX. Good dieting along with dietary supplements that help cleanse the liver and kidneys. Think milk thistle, garlic, chanca piedra and my proprietary formulation NutriGout is meant to provide the right nutrients to maintain a healthy liver and kidneys.